nice shading and details. but her face is a bit bony, in addition with small arms it makes her zombilike. and that crow need a beak. Actually, I have planned her to look bony. However, I guess I overdid it a bit. The fun thing is that this seems to only become obvious when either somebody mentions it or when it's viewed outside of Photoshop. Lol. Terminator - half human, half machine. Stronger than any other character of LF2 and, at the same time, equipped with a computerized brain. Rumours exist that only a "\0" can stop him. For those that don't know, google "null terminator". 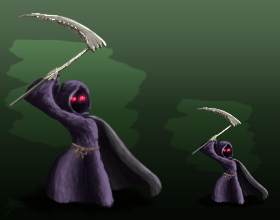 Yet another reaper - because I was annoyed by the suckiness of the old version. 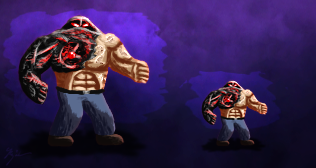 his half upperbody isnt very machinery, but rather burnt up flesh. grey would be more suitable instead of black. so his left arm is kinda too fat. he already have BIG arms, but fist should be bigger. i don't know if you wanted draw it like this, but position of thumbs is kinda weird. and last thing about that i'm not sure, but torso would be kinda thinner. reaper looks very good, but imo shading of robe looks kinda like fur, also shading of coat make it looks "heavy". 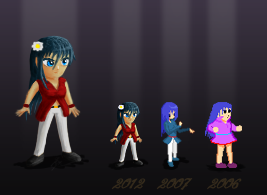 I'll keep your advice in mind for future sprites (as I really start to hate the sprites I post here xD). Time to add some new stuff to my hate-list! SOOOOOOOOOOO AWESOME! And you're finally back posting! And are you really making a mod? don't stop! I really want to see your spriting in 1 character at least. Seth -- Posessed by evil spirits, he hides his face behind a theater-mask. 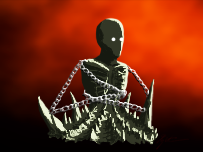 Made for the sprite theme contest "shadow entity". 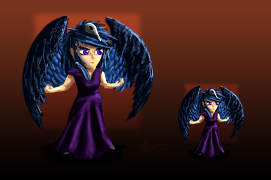 Zenobia -- The very first character I have created (and, like probably any first char, ridiculously overpowered). 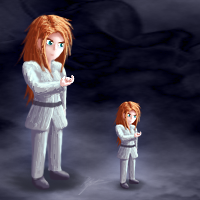 However, a full sprite-sheet only exists in the 2007-version. In honor of me being chosen for the Revamped Sprites thread, another! Scarlet -- although not looking strong, she can cast powerful dark elemental magic during which the patterns on her dress glow deep red. 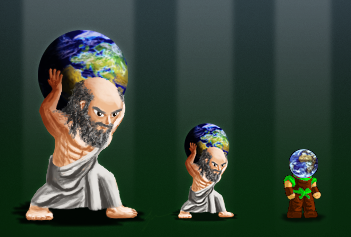 More of forgotten sprite-concepts that I did months ago and never got around to post 'em! Some kind of normal guy in his mid-30s that has decided it's boring to just go to the fitness studio and puts his strength to good use in beating up some people that deserve a royal kick in the rear. A psychic who uses telepathy to control others (i.e. doesn't fight herself and lets others do the dirty work). Current time: 04-21-2019, 01:43 PM Powered By MyBB, © 2002-2019 MyBB Group. Theme created by Silverthorn.